Swedish information to parents of infants, translated to English. Information to the parents of infants! Infants have a soft cranium during the first yer of life. If the infant has the head in the same position often when in the supine position the head can be deformed. This can result in posterior flattening, bulging of the forehead, misalignment of ears and facial asymmetry. 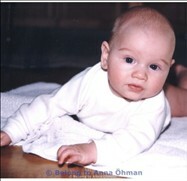 Example: infant (7 weeks) with posterior flattening and forehead bulging on the right side. If treated with positioning i.e. no pressure on the flattened side of the head it can disappear totally in younger infants (this infants head was symmetrically at 12 weeks of age). It is important with variation of the position of the head when the infant is in the supine position to avoid plagiocephaly or flattned head. Time in prone position when the infant is awake and under supervision is highly recommended. (Also reffered to as tummy time). The infants head is free from pressure ande the prone position gives the infant opportunity to train head control, strengthen the muscles of the neck and stimulates the motor development. Infants should as recommended sleep in the supine position. If your infant has an obvious asymmetry of the head contact a paediatrician or a paediatric physiotherapist with experience of this for consulting.